MARC Leishman and Jason Day have survived scorecard blowouts that would make weekend golfers blush to be well placed at the Tournament of Champions in Hawaii. 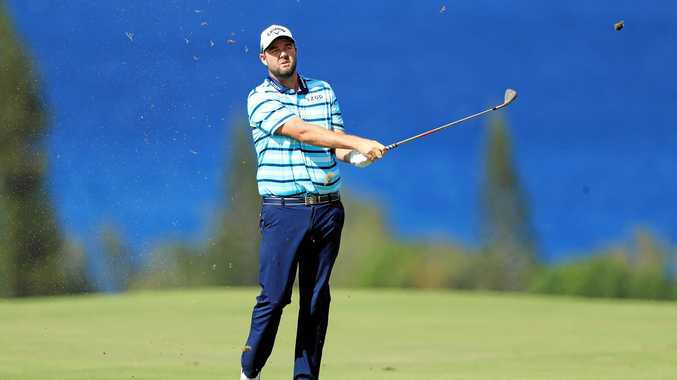 During Saturday's second round (AEST), Leishman and former world No.1 Day each racked up triple bogeys that could have derailed their hopes at continuing Australian success at the winners-only event on Maui. But Leishman steadied the ship to post a three-under-par 70 at Kapalua's Plantation course to sit at eight under and four shots off 36-hole leader Gary Woodland (67). The big-hitting Woodland rattled off eight birdies - including five consecutive from the 11th hole - and two bogeys to climb to 12 under and three shots ahead of four-time major winner Rory McIlroy (68), Bryson DeChambeau (68) and Kevin Tway (71). World No.20 Leishman started the second round just two shots off the pace before a wild tee shot found a hazard at the par-four sixth hole. Once on the green, a three-putt resulted in a triple-bogey seven but he stormed home with a birdie on the ninth and five more on the back nine. "I was pretty frustrated after a triple bogey," Leishman admitted. "It was just a really bad tee shot .. but apart from the sixth hole I actually played pretty good - to birdie six of my last 10 holes got me back in it." Countryman Day's triple bogey came after he hit two consecutive tee shots into a hazard at the difficult par-three eighth hole. His third attempt finally found the green and he salvaged a score of six when he drained an 8m putt. But like Leishman, the 12-time US PGA Tour winner Day bounced back and went three-under for the rest of his round to post a 71. At six under the card Day shares ninth, six shots behind of Woodland. "I just tried to keep my composure as much as I could - that's the hardest part when you get off to a good start and then have a hole like (the eighth)," Day said after his round. However, Day is confident of reeling in American Woodland, citing the fact he shares the course record at Kapalua - an 11-under-par 61 he shot during the 2015 event. "Definitely, I feel I have low scores in me this weekend," a defiant Day said. "I've given myself opportunities and if I can tidy up the silly little errors I can shoot my way back up the leaderboard." The Tournament of Champions is an elite $US6.5 million ($A9.3 million) event for winners on the PGA Tour from the previous year and doesn't have a 36-hole cut. Australians Geoff Ogilvy and Stuart Appleby have accounted for five victories since the event moved to Maui in 1999.